2:18PM Sky News: its your iPad optimised web gusher. And they take this important story from two different angles. The wrap-around the back of the head, and the full frontal prayer support of the chin. Both are risky stabs at the head in hand, but both count in my book. 2:07PM The Telegraph are knocking it out of the park today (thanks to Stevie T for this spot). 1:05PM Let’s go abroad again, and this time to one of the places being blamed for this crisis. Italy. A nice little top of the head reverse hold here from Il Foglio. Their story is headlined: Il feticcio della discontinuità Google Translate fans. 12:58PM Oh Washington Post. Have courage of you convictions. On the front page you lead with this great photo. Click through and it the boring old Reuters Sun one from below. 12:26PM Mark S points out something very interesting regarding Black Friday. If you Google it these days you are much more likely to get this. REBECCA BLACK FRIDAY. Kat has also found some useful advice if the news is disturbing you: What to do if the news upsets you. Though kicking off with a recap of the Dublane massacre seems a touch counter productive. Daily Mail using an AFP image here – which is known in the business as a Bad-Day/Nosebleed shot. 12:13PM If you are finding this all too depressing, why not go to “Women Laughing Alone With Salad”. 12:06PM And now to Australia, where we may have a hint of what we are expecting when the US opens. Namely the trifecta of the Banker head in hands WITH A MOBILE. 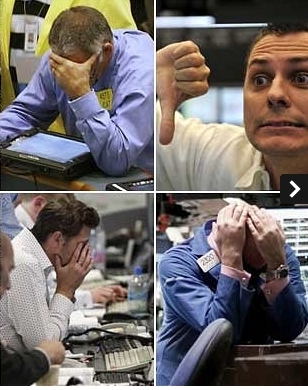 This is one hand, nicely splayed fingers, with something in the other, from News.com.au – taking a parochial view of the crisis (Australian sharemarket dives after Wall Street tumbles on recession fears). I think its the first place I have seen the phrase BLACK FRIDAY used with regards to today however. 11:49AM I have started to notice a slight trend. 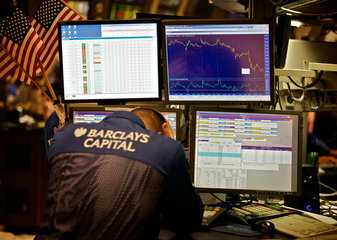 Its almost as if Barclay’s Capital traders are TRAINED to put their head in their hands in the most photogenic way. What photographer, from say the Telegraph, could ignore this little beauty. Yes its a one hand, face job but such pathos, such drama. 11:42AM US Markets haven’t opened yet but the New York Times is an old hand at these. These two are classics from their front page slideshow. 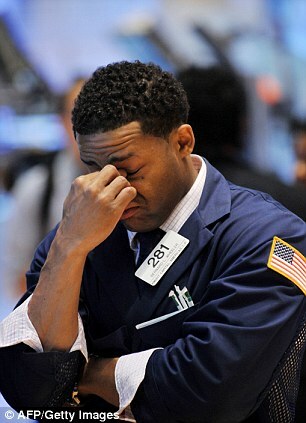 11:33AM It is a Global Recession after all so let’s see what the Germans are saying. Welt Online uses the wonderful phrase SALAMICRASH – but no proper heads in hands. 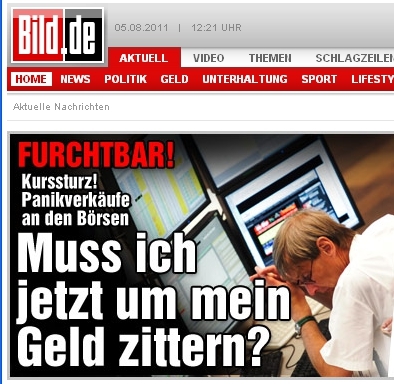 Bild on the other hand goes the Sun route (not just with naked women on its front page). If anyone can do the German for me that would be great. 11:25AM The Daily Express as ever doesn’t worry so much about the global economy, rather WHAT WILL IT DO TO OUR PENSIONS BOO HOO! 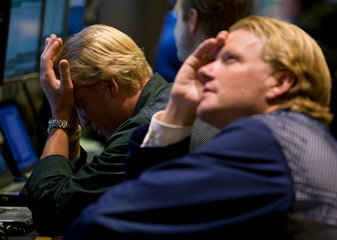 Note this picture of Barclay’s trader with head in hands may be an old one from when he discovered Diana was dead. 11:15AM The Tabloids are happy to play this game too, though are completely down with the programme. Here we have The Sun with a one hand one head policy from their Market panic as shares crash further page. 11:07AM Nice work here from the Telegraph. A four way montage : three with heads in hands, the fourth with a thumbs down from their DEBT CRISIS LIVE page. 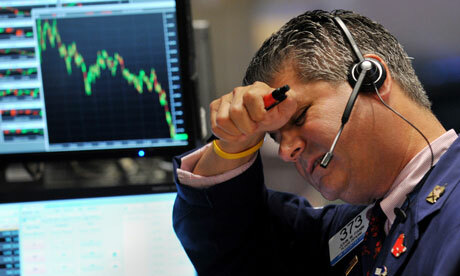 The Guardian: Banker with head in hand left profile. We so far have none (current) of the head-in-hand-WHILE-ON-MOBILE twofer. We will have to wait for the US markets to open for that beauty, I suspect! Does anybody else think those Barclay’s Capital jackets make traders look like a cross between telephone service engineers and grounded astronauts? I like that you can shout about plummeting share prices with one word in German. The feticcio of the discontinuity! Google Translate give THE FETISH OF DISCONTINUITY – sounds like a Topology lecture to me. “The fetish of discontinuity”. Them pesky Italians! Ah! Takes me back to 19 October 1987 and walking into the dealing room, normally a noisy place but on that day sullen and silent, the SEAQ screens introduced only a year earlier dripping with blood (falling stocks being indicated in red, rising ones in blue). The faces of the Liverpool Street Set pale as the waning moon. 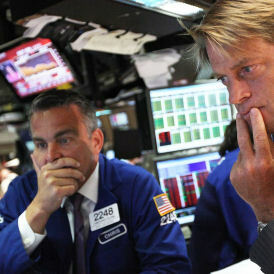 The London crash on that day was doubly severe; on the preceding Friday while the Dow Jones, Nikkei and Hang Seng indices were tumbling, the London markets were disrupted by the previous night’s legendary storm. There was something apocalyptic about that. Rosie strode through the dealing room with a bit of a smirk on her face. She had wisely and vocally resisted the temptation to buy cut-price shares in the utilities she believed she already part-owned. The rest, of course, is history. Sid (“Sell In December”) took his modest profit quickly and the utilities, as they were always intended to, passed into the hands of City institutions, pension funds and international racketeers. The fettucine of the discombobulation! Over the various monitors and screens in these photos I will be superimposing pictures of teenage girls celebrating their exam results. 1.25pm: David Cameron, on holiday in Italy, had a telephone conversation with Bank of England governor Mervyn King, to discuss the worsening eurozone debt crisis. He also spoke to foreign minister William Hague, the most senior member of the government in London at the moment. George Osborne and Nick Clegg are on holiday. 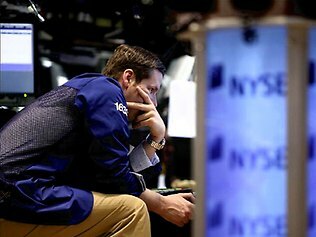 Why do Wall Street traders wear blue jackets? When I was very small photos of them on the news led me to believe this was what ‘blue collar jobs’ meant and that the stock exchange was in some way hand-cranked. 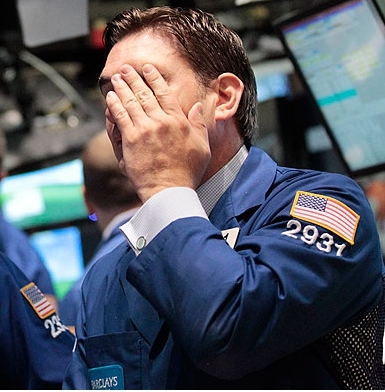 Panic sales at the stock exchange. Do I have to tremble in fear for my money now? where are the GURL BANKERS? Me and my technology work-mates at a well-known investment bank used to make the same observations about the media portrayal of recession hit traders. 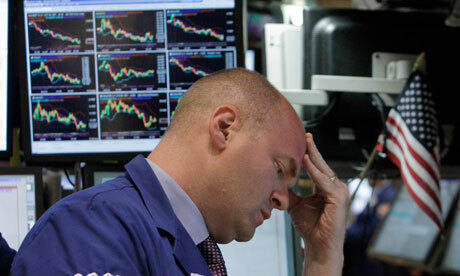 What we never saw was a picture of some smug trader git smiling because he shorted the market instead.